Summer unofficially came to an end after this past Labor Day weekend, though summer is not officially over until September 23rd. Still, now is the perfect time to start preparing your home for winter. And, if the climate experts at the National Oceanic and Atmospheric Administration are correct, it is going to be another harsh winter here in Baltimore. Are you ready? More importantly, is your home ready? What about your deck? Established in 1987, Mid Atlantic Deck and Fence specializes in the design and construction of both wood and low maintenance decks. In fact, Mid Atlantic Deck and Fence is one of the only companies in Baltimore that custom designs, builds and installs all of our own decks, fences, pergolas, pagodas, gazebos, and screened porches. Cleaning: Power washing may be needed from time to time in order to remove excess dirt or stains. Repairs: Before going any further, inspect your deck for any signs of damage or rot. Make any repairs before moving on to the next step. 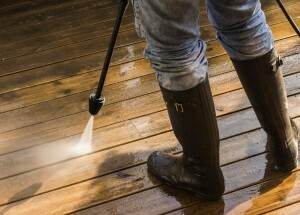 Staining and Sealing: It is important to use a good quality sealer or wood stain normally 30 to 90 days after deck construction and every year or two after that. This will help shield your deck from moisture. Don’t forget, low maintenance decks are not NO maintenance decks. In fact, there is no such thing as a no maintenance deck. Still, low maintenance decks do offer homeowners a much less labor-intensive decking option. So if you are tired of cleaning, sanding, staining or re-sealing your old worn-out wooden deck year after year, low maintenance decking may be the way to go. These decks are designed to stand up to the elements, allowing them to maintain their beauty for years with – you guessed it – little to no maintenance. Cleaning: Grab a power washer and get to work. Just be careful not to damage your deck. Keep the nozzle at a safe distance from the deck surface. Yup! That’s it. If you have any questions about Deck Maintenance in Baltimore, please contact Mid Atlantic Deck & Fence (MAD Fence) today by clicking here or calling 1-800-833-9310. You can also follow us on Facebook and Twitter as well.